Pre-order to get an additional mission: The Blind King. Meet a mysterious traveller that will prove to be much more than he appears as his past is revealed. Write your own legendary odyssey and live epic adventures in a world where every choice matters. 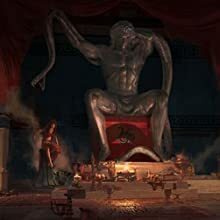 Sentenced to death by your family, embark on an epic journey from outcast mercenary to legendary Greek hero, and uncover the truth about your past. Forge your path through a war-torn world shaped by gods and men, where mountains and sea collide. Meet Ancient Greece's famous figures and interact with a pivotal point in history that shaped western civilization. Assassin's Creed Odyssey brings player choice to the forefront through innovations never-before-seen in Assassin's Creed as you choose the hero you want to become and change the world around you. Through the relationships you build with colourful characters & the decisions you make along your odyssey, it is you who is in control of your destiny. Customise your equipment and master new special abilities, tailoring your hero's skillset to your play style. Fight your way across Greece, engaging in visceral battles both on land and sea, to become a true hero of legend. 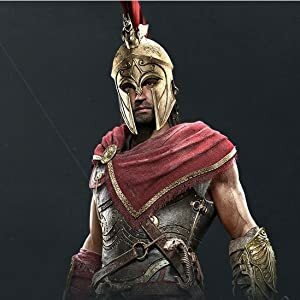 BECOME A LEGENDARY GREEK HERO - In a first for the Assassin's Creed franchise, you can choose which hero to embody throughout this epic journey, Alexios or Kassandra. Customise your gear, upgrade your abilities, and personalise your ship on your path to become a legendary Greek hero. DELVE INTO ANCIENT GREECE - From the heights of snowy mountain peaks to the depths of the Aegean Seas, explore an entire country full of untamed environments and cities at the peak of Greece's Golden Age. Unexpected encounters will breathe life into your story as you meet colourful characters, battle vicious mercenaries, and more. CHOOSE YOUR OWN PATH - Your decisions shape the world around you with over 30 hours of choice dialogue and multiple game endings. Experience a living, dynamic world that constantly evolves and reacts to your every decision. 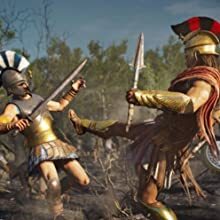 FIGHT EPIC BATTLES - Demonstrate your extraordinary warrior abilities and shift the tides of battle during the Peloponnesian War. Charge into epic clashes between Sparta and Athens in Big Battles pitting 150 vs 150 soldiers against each other. 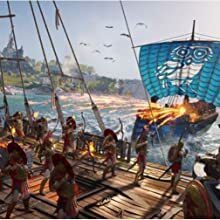 SAIL ACROSS THE AEGEAN SEA - Find uncharted locations, uncover hidden treasures or cleave your way through entire fleets in naval battles. Customise the look of your ship, upgrade weaponry to suit your strengths, and recruit crewmembers with unique perks, tailoring naval combat to your style. A LAND OF MYTHS & LEGENDS - Discover a world rich with myths and legends. From ancient rituals to famed statues, come face-to-face with Greece's legendary figures and discover the true nature of mythological beasts like Medusa and the Minotaur. As with any offering from the gods, the future isn't always certain, but we are hopeful that the unnamed gifts will bring you good fortune. 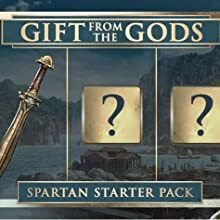 Ancient Greece is waiting, so claim your Spartan offering and get ready to leave your mark in history! 5.0 out of 5 starsBest Assassin's Creed yet! Took everything that made Assassin's Creed Origins an amazing game and turned it up to 11! massive world to explore, beautiful scenery and colourful characters. One issue I have is the lack of a Discovery Tour mode (fantastic addition in Origins), it suppose to be coming later this year (2019) though. It doesn't *need* Discovery Tour but it would certainly round off an amazing experience. Assassin's Creed fans should definitely add this to their collection and even people new to the franchise should pick this up too! 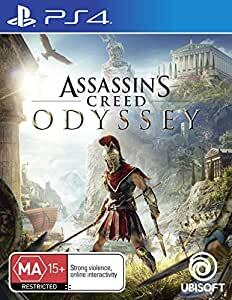 I though AC Origins was a great game, but the AC Odyssey have outdone its predecessor. It's a spectacular game that clicks on all cylinder, gameplay, story, sound, visual...etc. A must buy for your collection. The best AC so far. Everything from the voice acting to the environment (whales and dolphins swimming in the waters -wow!). So far I haven’t felt the need to purchase anything to help me progress. Disk works fine, game is so much fun :) I haven't played an assassins creed game in forever but it's very easy to get back into and this one is excellent. I am 83 years old and have played video games from the start of gaming.